notification 2018. Exam Pattern and Syllabus for this Krishi Seva Exam is updated in this article. Agriculture Degree having candidates may apply online for this UPSSSC Technical Assistant Posts Examination on or before 23-08-2018. Online applications are accepted through UPSSSC website of www.upsssc.gov.in. These Technical Assistant posts of UPSSSC will be through computer based online test and interview only. For exam pattern, exam dare, admit card released date, online application process, online exam syllabus, vacancies, age limits for UPSSSC Technical Assistant (Pravidhik Sahayak Group C) general recruitment exam notification 2018 is updated below. Agriculture (Krishi) Degree qualified candidates are eligible to apply online for this UPSSSC Krishi Seva Exam 2018. Age limits cut of date is 01-July-2018. Lower age limit for all the categories candidates is 18 years. For SC/ST candidates upper age limit is 45 years. For OBC -43 years and for General 40 years. Selection for this UPSSSC Technical Assistant recruitment 2018 will be held based on CBT Test and interview. Written Exam consists of 200 questions. Each questions carries 2 marks. 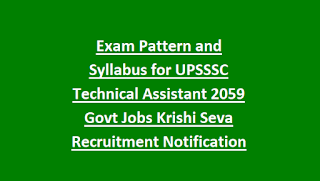 Exam Syllabus for these Technical Asst is Group C pattern only which is issued by UPSSSC in 2015. Fee is Rs.185 for general, OBC candidates. The candidates who are having Agriculture Degree they can apply online for this UPSSSC Pravidhik Sahayak Posts through the official website of www.upsssc.gov.in only. Then download the exam syllabus and pattern from the above given link. 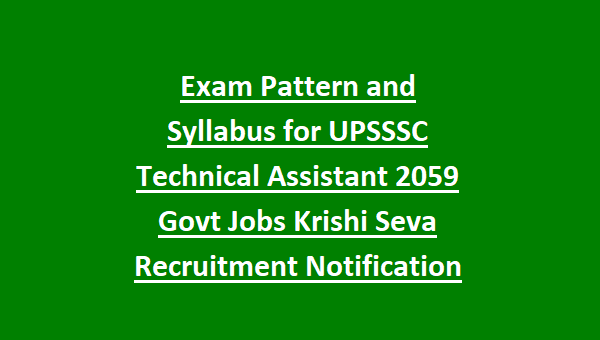 Click here to apply online for UPSSSC Technical Assistant Recruitment 2018.